This place is a store tucked into an old industrial area in the Bucktown neighborhood, not far from downtown Chicago. It is carrying produce, dairy, eggs, and meats from farms in the Midwest region centered on its biggest city, along with fresh, frozen and packaged foods from top regional artisans. It also houses The Butcher and Larder, Rob Levitt‘s popular meat shop that sources from local producers and moved from its original and much smaller store a bit farther south in the city. 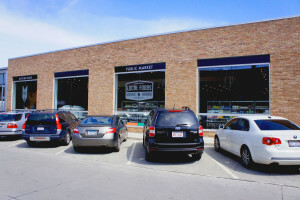 And much of the space is taken up by a cafe called Stock, headed by well-regarded local chef Abra Berens, which is utilizing the seasonal products sold in the store. For Cleverdon — whose Kinnikinnick Farm is located about 85 miles northwest in Caledonia, Illinois — the store is the latest big step forward in the fast-growing Good Food movement, which has stimulated consumer demand for local and sustainable producers such as him. The other speakers, and those in the crowd of about 200 who attended the long-anticipated opening on June 30, agreed. 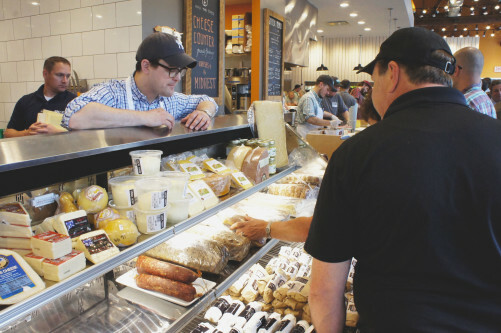 Local Foods, in fact, has added the retail store to its distribution business, which has focused its work on helping producers — many of them with small and medium-sized farms and businesses — solve the logistical challenges of getting their goods to market. 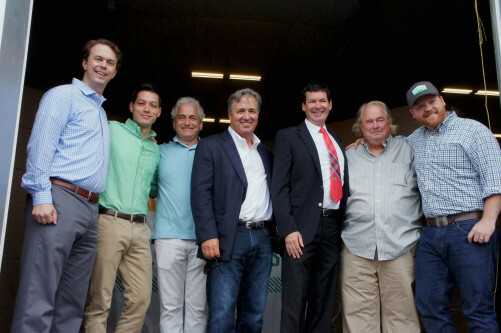 Lutsey shared the loading dock “stage” with three other Local Foods leaders — Chairman Jim Murphy, Chief Operating Officer Dave Rand, and Chief Financial Officer Ryan Kimura; along with Cleverdon; Jim Slama, president of FamilyFarmed; and Chicago Alderman Brian Hopkins, in whose ward the store is located. Slama said Local Foods’ efforts to solve farmers’ knotty logistical problems is playing a big role in stimulating further growth of the Chicagoland Good Food market. 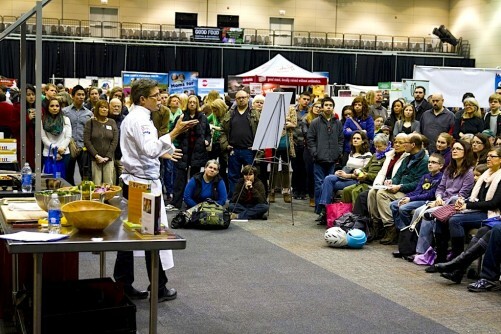 “We’ve been doing our Good Food Festival for 11 years, and boy, back then, there really were not great systems for getting Good Food from local farmers to restaurants and supermarkets and other places,” said Slama, who has worked closely with Local Foods in an advisory capacity since it launched its distribution business — selling food from regional farmers, mainly to restaurants and their chefs — two years ago. Celebrating the grand opening of the Local Foods Chicago retail store on June 30 were Andrew Lutsey, Local Foods CEO; Ryan Kimura, Local Foods chief financial officer; Jim Slama, president, FamilyFarmed; Jim Murphy, Local Foods chairman; Chicago Alderman Brian Hopkins; Dave Cleverdon of Illinois’ Kinnikinnick Farms; and Dave Rand, Local Foods chief operating officer. 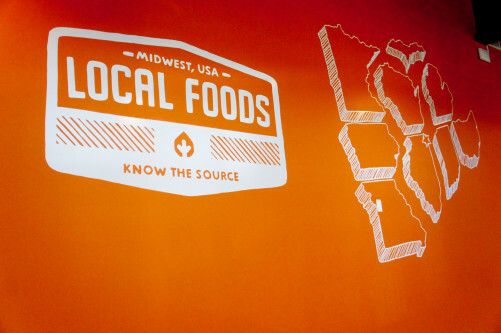 The wall at the entrance to the Local Foods store in Chicago includes the logo and a map of the Midwest states from which it sources its products. Just inside the store’s entrance is an orange wall painted with the Local Foods logo and a map of the states from which it obtains the food it sells. While Local Foods defines “regional” a little more broadly than some in the Good Food movement — from Minnesota in the north to Missouri in the south and then east to Ohio — most of its producers are from closer to Chicago and will be familiar to those who shop in the city’s farmers markets and specialty grocers. 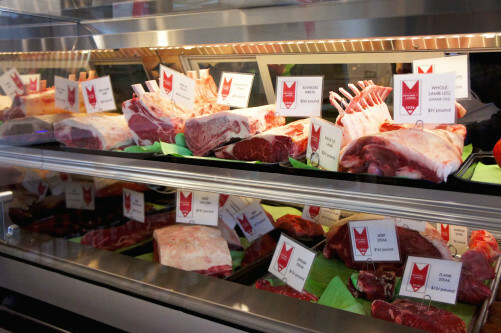 A much larger display case, a separate cutting room, and a smokehouse are among the upgrades that The Butcher and Larder meat shop enjoys with its move to the Local Foods Chicago store from its original, much smaller location. The next thing customers see is the expansive meat case at The Butcher and Larder’s new location. Everything about this store within a store is bigger than the original: that case, a separate cutting room (Levitt and his crew had to break down whole carcasses on tables in the middle of the old shop); and a spacious smokehouse that already has turned out a steady supply of bacon (a product that was often out of stock in the previous location because of its smaller capacity). Apart from the outstanding quality of the meats he sells and his whole-animal approach to butchery, Levitt gained a following because of his emphasis on customer service. He freely provides advice on meat, often suggesting lesser known but delicious substitutes for more expensive cuts, as well as how to cook them, and what to serve them with. Rob Levitt (behind counter) is partnering with Local Foods and moved The Butcher and Larder, his popular — but much smaller — butcher shop into the new retail space. So one of the things that has the former college music major jazzed about his new location at Local Foods is that customers can take his suggestions, go to the other end of the store where the produce, dairy, frozen foods, and packaged goods are located, and make it a one-stop shop. “We can sell you a steak and tell you to go back and buy some mushrooms. If you’re going to fire up the grill, you can get a pork chop and some asparagus. It’s full circle, it’s the whole thing,” Levitt said. 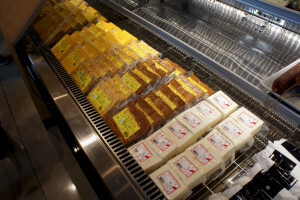 Phoenix Bean tofu is among the many locally produced foods for sale at Local Foods’ new retail market in Chicago. Jenny Yang, Phoenix Bean’s owner, was a Fellow in the recently completed first year of FamilyFarmed’s Good Food Business Accelerator. He continued by saying that mission to broaden customers’ knowledge extends to the Stock cafe, separated from The Butcher and Larder’s corner by a charcuterie case and cheese counter. “If you’ve never had kohlrabi, we can tell you all about it, what it is, and you can sit down at the café and if it’s in season, there’s a pretty good chance that it will be on the menu,” Levitt said. 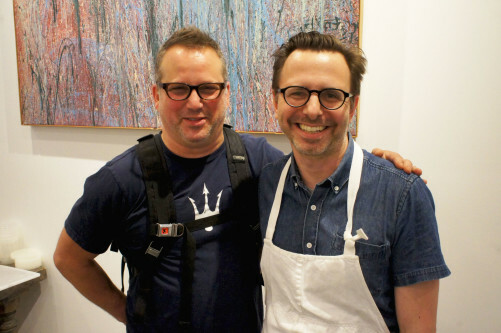 Education about Good Food also is a priority for top Chicago chefs such as Hammel and Paul Kahan, a James Beard Foundation Award winner whose One Off Hospitality restaurants (Blackbird, Avec, The Publican, and Nico Osteria, among others). The two — who participated in the grand opening event — are among the co-founders of Pilot Light, a program in which chefs work with Chicago Public Schools to integrate food-centric lessons in grade school students’ curriculum. The message is getting through to the nation’s youngest consumers, said Kahan. “I bugged my parents about smoking and wearing seat belts, the campaigns that were in the media at the time. Now kids are starting to bug their parents about food. I want to eat that! It’s packed full of nutrients, it’s organic, it’s locally grown,” he said. Chefs Paul Kahan of One Off Hospitality Group and Jason Hammel of Lula Cafe — longtime leaders in establishing the “farm to table” restaurant trend in Chicago — participated in the grand opening of the Local Foods retail store. The one disclaimer is that shoppers should not expect aisle after aisle of shelves higher than their heads as in a typical commercial supermarket. 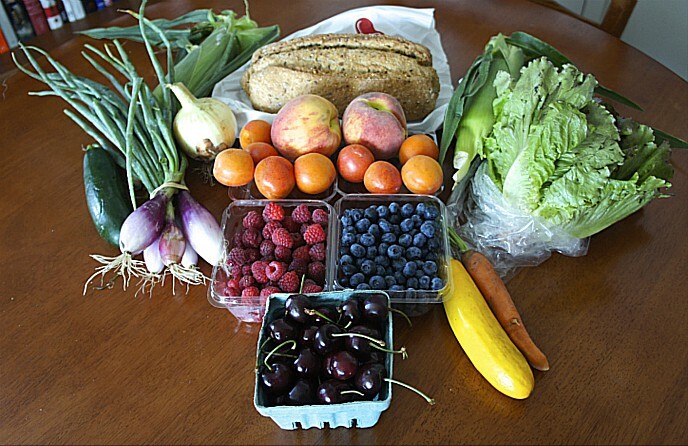 The concept of the Local Foods market is not bigger, it’s better, providing the public with access to the quality of fresh, local food that the distributor previously sold mainly to chefs — and doing so 12 months a year, including the wintertime when most local farmers markets shut down for the season. “This facility is beyond our expectations and dreams. I think it’s amazing that someone built something like this to support all the potential that we know is there,” Hammel said. Local Foods is located at 1427 W. Willow Street in Chicago, near the intersection of North and Elston avenues. The store hours are 10 a.m. to 8 p.m. seven days a week, though the store is closed this Saturday for the July 4th holiday. This entry was posted in Beef, Culinary Trends, Farm businesses, Farm to table dining, Food access, Food Artisans, Food education, Food Entrepreneurs, Food Hubs, Good Food Business Accelerator, Good Food business development, Good Food marketing, Local Food, Regional food systems, Sustainable food business investment, Sustainable food retailing and tagged Chef Jason Hammel, Chef Paul Kahan, FamilyFarmed, Kinnickinnick Farm, local food marketing, local food retailing, Local Foods Chicago, Lula Cafe, One Off Hospitality, Pilot Light, regional food, Rob Levitt, sustainable food retailing, The Butcher and Larder. Bookmark the permalink.